When it’s too cold to go for a walk or play your favorite sport outdoors, take your kids inside for some exercise. There’s plenty you can do to help keep your family fit. Try some of our favorite indoor exercises or create your own! Dance to your family’s favorite music. Moving your body is a great way to exercise your heart. Mix it up with new dances like salsa or swing to keep your kids excited about shaking their hips. Jumping Jacks and a Hula Hoop contest to see who can go the longest are a fun way to burn some calories and build coordination with your kids. They’ll make everyone jump for joy (and health)! 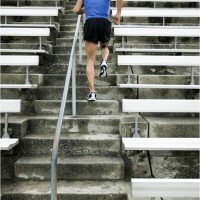 Walking Stairs can strengthen your legs and keep your heart strong. A study by the European Heart journal show that employees, who consistently chose the stairs instead of the elevator, lost 1.7% body fat, reduced their LDL (or bad) cholesterol by 3.9% and improved their lung function by 8.6% over just 12 weeks. Make it fun by seeing who can walk the most flights in one minute—increase the time for a greater challenge! Take the stairs when shopping or traveling too –keep your body moving to keep your body healthy. Ask for a work out DVD for a holiday gift. See what your friends recommend. Try something fun even if it seems cheezy. I bought hip-hop abs off an infomercial –and enjoy it even though I know I look ridiculous doing those moves. Get moving during commercials. Implement a new house rule. During TV time, no sitting still during commercials! Jump up and down, do jumping jacks, dance or wiggle like a worm until your show comes back on.